In this weeks "Deal of the Week" on Xbox 360, the Gears of War 2: Combustible Map Pack will take a nice price cut. If you've been waiting to unleash some awesome in the Combustible map packs new levels, wait no longer. Normally 800 , Xbox LIVE Gold Members will only have to fork over 560 this week! The Combustible Map Pack features 3 new stages, Flood, Gold Rush, and Fuel Station. "Flood features a rising flow of Imulsion that drives the fight into close quarters. Infiltrate an Imulsion factory in Gold Rush, where multiple levels and volatile materials guarantee memorable encounters. Fuel Station delivers a dangerous battle around an abandoned refueling facility"
Well, what are you waiting for, add it to your queue! 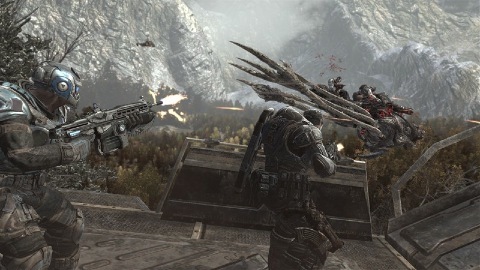 Gears of War 2 - 4 Player Co-Op Slip-Up? Page created in 0.3132 seconds.